A hell of a lot better than the second movie, this one picks up the slack from that stinker and actually has some clever ideas, including a movie within a movie, and a new mystery of its own. A surprisingly pretty good movie, especially after how bad the second film was. Like the Hangover 3, this one can’t even come close to the first movie, but it certainly surpasses the second. This time around, the y are trying to go for something kind of new, which is to set everything on a movie set, of a movie that depicts the events of the first Scream. Talk about a way to get some meta ideas in, of having not just a movie within a movie, but a movie that has them filming another version of the first film. It makes for some pretty creative scenes, like when Sydney goes into the same rooms that she was in during that first movie, and relives some of the same moments. The serial killer mystery part of the movie, (which really is the main part,) is just okay. One thing that works about it is the way that this killer leaves clues and creates a much bigger and more elaborate mystery than we are used to. What doesn’t work is the way the movie tries to force characters from those original movies together, be it Sydney, Gail, and Dewey, or a cameo from Randy. Luckily there aren’t many of those moments, and the movies attempts to be clever end up mostly panning out. 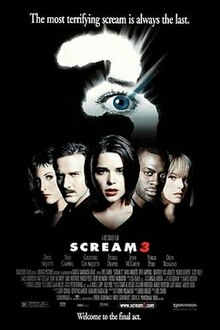 Scream 3 is just an okay movie. The truth is, this series has had an especially good film since the very first one (and that also includes the fourth movie, which barely features the same cast.) The first movie was fresh and original in all the right ways. It took the staples of the teen horror genre and turned them on their head by giving us protagonists who were experts in the genre. They knew all the mistakes characters could make and how to avoid making them. That movie was so good, in fact, that it kick-started a whole new genre (or the return of a genre,) which was the teen horror movie craze. From I Know What You Did Last Summer to Urban Legends to Halloween H20 (that’s right, the original movie that started the genre was now getting another entry all because of Scream,) there were quite a lot of these movies. But only Scream was actually good (Urban Legends wasn’t bad.) The rest really couldn’t find their footing to feel like something original. The second Scream movie was terrible. It was so rushed, in fact, that they put in the Broken Arrow music while filming, as filler music so they could see what the movie would look like with music in it, and then forgot to take it out. What a huge, stupid mistake. But that shows you how much the second movie was rushed. Luckily, the third film is way better than that second stinker. The first time Sydney, (Neve Campbel) in high school. The second time she was in college. Like the 21 Jump Street movies, (and their barage of potential sequels that worked as a post credit tag to their second film,) the question of where to go next is not so obvious. In the case of Scream 3, the answer is a film set. It actually works for this series, and everything it has set up before. You see, in the second movie, (bad as it is, it still had a couple of decent ideas,) we learned that the events of the first movie had been made into a book, by Gail Weathers, (Courtney Cox’s news reporter,) and then the book had been turned into a movie. That movie was Stab. This was. perfect way to continue the meta movie within a movie, thinking outside the box. idea of the first film. The second movie only had that opening scene, (at the premiere screening of the first Stab movie,) but other than that, there was no outside the box kind of stuff. Here, it is all over the place. This third Stab movie that they are making is literally replicating the events of the first Scream film, (now one never stops to ask, what did the first two Stab movies do, if the events from the first Scream still haven’t been told yet?) But that question isn’t especially important here. While some of the ideas are good, the dialogue writing is often pretty terrible. Take Syd and her father, for example. When we see her for the first time in this film, she’s living with her dad, working at a teens in crisis hotline. And her father comes over and talks to her about the job, calling her out on something where she never interacts with anyone face to face, and saying “it’s almost as if you don’t exist.” Great dialogue. And then her very first call that we see in this movie is a woman who turns out to be the ghost face killer on the other end of the line. I appreciate this movie not wasting any time, but C’mon. If they want to show us that Syd is working for this hotline now, and what life is typically like for her these days, then at least start by giving us the kind of call she dealt with. Not something like this that forces us into the main plot before we have even really gotten to know the character again. Speaking of forcing things, Gail and Dewey (David Arquette,) manage to both be on the set of Stab 3, and of course, to fall for each other again. Just to get this straight, every movie they fall for each other, then in the time in between movies they separate (off screen, of course,) and then when the next movie rolls around they reunite and get back together. It’s pretty dopey. And even dumber that Syd would go there. The idea is that Dewey is a consultant on the movie set, murders start happening there, so Gail shows up (just like the reasoning that brought her to the college campus in Scream 2,) and then, for the one that makes the least sense… Sydney goes there because Gail and Dewey are there. So she willingly leaves her home, in hiding, (yes, the killer found her via phone, but still had no idea where she lived or was,) in order to go to the place where the killer is. Some explanations, or attempts at explanations, make no sense at all. We get it. The movie needs to bring these three characters together. But how about doing it in a smarter way? Luckily on the movie set itself, things do get a little better. We meet the actress playing Gail Weathers in the movie, Jennifer Jolie (Parker Posey,) and she’s a lot of fun. She tries to out-Gail Gail, often saying things like, “What would Gail Weathers do?” or “Gail Weathers wouldn’t give us so easily,” while the real Gail Weathers is right there. In fact, Jolie is often talking to Weathers when she says these things. And seeing the two of them, run around chasing down clues to a mystery together, is a lot of fun. Posey’s character is probably the best in the movie. Her relationship with her bodyguard is so quiet and underplayed that it is just perfect (at one point she jumps up into his arms and he catches her, as if he just knew she was about to do that.) There’s the question of whether or not she is actually seeing Dewey at the time the movie begins, but that question is more in Weathers’ head than anything else. There are some other things that this movie does to really separate it from the previous two films, that definitely work. One is that the killer leaves clues behind at the sites of his murders. The clues are photographs of Maureen Prescott, Sydney’s mother. Our characters (mainly Gail and Dewey,) spend a good amount of time tracking down those photos to figure out when and where they were taken, and what they might mean. They never figure out the last part, and how the photos relate to the killer, but they do get pretty far and uncover a whole backstory that we never saw coming. And then there’s also a supernatural element here, also involving Maureen Prescott, where Sydney sees her mother as a ghost. Perhaps this is spurred on by the fact that the killer has Maureen’s voice programmed into his voice box, or maybe that’s just in Sydney’s head too. We don’t know and we don’t need to know. The movie wisely keeps us suspicious, and that makes us more curious and more interested. Despite some of these clever ideas, the movie does fall into cliches more often than it should. Randy, the lovable nerd from the first two movies, who died in the second one, just has to make an appearance, for example. He arrives by way of video tape, that is delivered to the movie set by his younger sister. The tape was made before Randy died, just in case he died and spells out the rules of a trilogy. It’s this movie’s way of trying to do what the first film did, announcing the rules of a serial killer horror movie. The second movie tried to do this with sequels and didn’t get very far. This Randy tape attempt isn’t much better. But that’s only one quick scene, and there’s a ton of other things to praise here, regarding the creativity of other scenes. Because the movie they are making, Stab 3, is about the original Woodsboro murders, the sets here are those of the houses from the first movie. So we get scenes of Sydney falling out windows just like she did in the first film, and even using her door knob holding another door knob, bedroom door locking trick (on a set that is a replica of her old bedroom.) We get a scene where an actress hides from the ghost face killer in a costume room where she is surrounded by hanging ghost face costumes. All of these make for a bunch of fun scenes. The movie ends up being about as good as it can be. There’s no touching the original film here, which really gave us something fresh, but this movie does a much better job than the second film did, and does have a good amount to enjoy and appreciate.